Using the steel- and auto- related job losses in the early 1980s as an example, a paper discusses the long-run effects of massive job losses. The authors found that after an initial spike in the unemployment rate in the impacted local economies, the rate converged back to the national average after five or six years. However, high out-migration (and low in-migration) led to this reduction in unemployment, rather than an increase in new jobs. Similarly, a landmark study found that those U.S. multi-state regions that experienced downward employment shocks returned to a more normal path of employment growth within five to ten years. However, the lost jobs were never recovered. I assume "lost jobs" refers to the actual position, not the total number employed. That gets me thinking about the disconnect between population and labor force. In popular parlance, migration is tied to population. If a region is shrinking, that means everyone is leaving. Those numbers reflect the 7-county MSA. 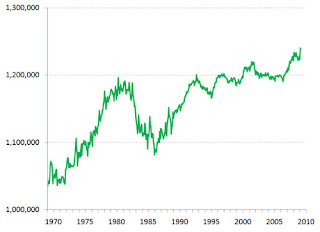 The economic crisis is the recession of the early 1980s. The long and painful recovery is evident. Someone correct me if I am wrong. From 1980-2000, the 7-county MSA lost about 200,000 people. Yet, by my reckoning, the labor force is bigger in 2000 than it was in 1980. Whatever the exact numbers, Pittsburgh's population shrank while the labor force is at least the same as it was just before the devastating recession. Or, look at the 70s. Again, the population declined over that decade. Yet the labor force dramatically grew. Even the powerful correction failed to reduce the number of employment seekers to 1970 levels, not even close. 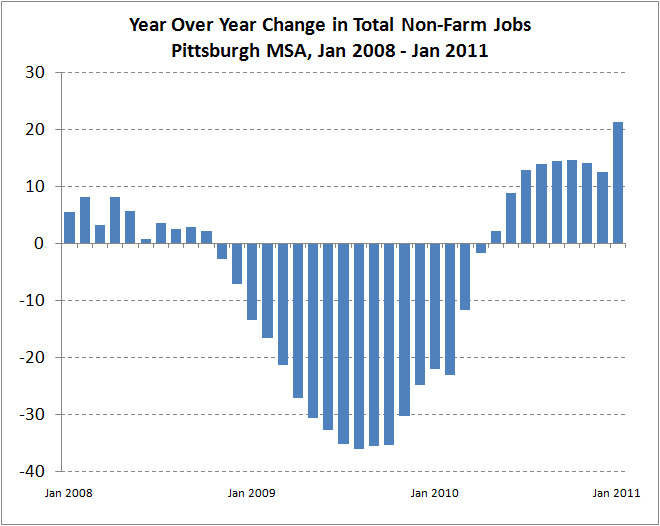 Unless my eyes deceive me, the Pittsburgh MSA has gained about 200,000 workers in 40 years. That's impressive for a dying city. Back to the original issue of net outmigration and economic recovery ... How much of the labor force is leaving the region and how long before those numbers return to pre-recession levels? The data we typically track include children and retirees. In other words, we consider total population. This is a lousy way to take stock of the situation. If the labor force is growing, then how can a magazine or newspaper label a metro as "dying"? 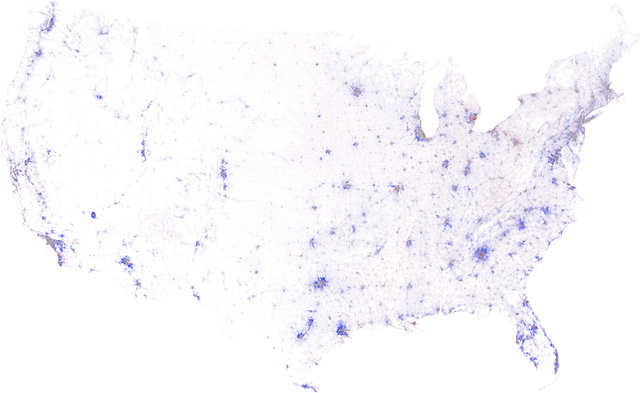 [Above] is the contiguous United States, color-coded by the change in population density from 2000 to 2010. In urban areas, deep blue indicates that the population doubled (or more), pure red means that everyone left, grey denotes no change, and the intermediate tones represent the spectrum of increases and decreases in-between. Below 5000 residents per square mile, these colors fade with the square root of density towards white, where no people lived in either year. We created these maps from the official U.S. Census 2000 and 2010 block-level population data and boundaries using custom-built cartographic software. This post made the rounds a few weeks ago. I just noticed (thanks to Aaron Renn) that the cartographer has since published more metro maps. Of greater interest to me is the one of Pittsburgh. Do click on the link to see the map. It is too big to paste here for reference purposes. Compare the urban core population growth with other cities. Around the Great Lakes, a recovering auto industry and rising global demand have helped stabilize labor markets. Moody’s estimates that new manufacturing jobs accounted for a fifth of the nation’s total job growth during the past year. And the large metros of the Great Lakes reaped an outsized portion of the benefits, having generated 20 percent of those new manufacturing jobs. These expanding job opportunities in manufacturing and in other parts of the economy are moving workers out of unemployment lines and onto production lines. Job growth in the region accounted for three quarters of its declining unemployment rate. Brookings maps the recovery and the Rust Belt cluster of the darker blue (best performing metros) stands out. I figure the Great Lakes states were forced to be more globally oriented since the population numbers were increasing elsewhere. The real estate/migration economies (i.e. construction jobs) are still tanking. More ironically, the Rust Belt cities of the Sun Belt are the ones doing the best in that region. Retooling in the wake of previous economic calamities is paying off (think Asian Financial Crisis). These metros are leaner and meaner than the boomtowns, places drunk with unabated growth. Speaking of surging Rust Belt cities of the Sun Belt, Greenville (South Carolina) is the focus of an article in the latest magazine for Southwest Airlines. I read about it while flying out to Denver from DC. I'm somewhat familiar with Greenville's revitalization story. I'll have to visit and see for myself. I'm intrigued. Attacking a policy is easy. Just say it will result in an exodus. Then cherry pick the data and hold a press conference. Be sure to appeal to popular opinion on the matter. Remember, everyone is fretting about brain drain. Your policy will stop people from leaving. Mission accomplished. But just because there are people moving out of New York and California and New Jersey, you can't automatically blame taxes. A lot of those low-tax states have sunny weather, cheap land and relatively healthier economies. It's a complex equation. What researchers needed was a natural experiment to tease out the influence of taxes. And they found just such an experiment, in Chris Christie's home state of New Jersey. "The vast, vast majority just don't respond to the tax. They stay put," says sociologist Charles Varner of Princeton University. I emphasized the part of the passage about devising a natural experiment. Whenever a politician invokes the red herring of outmigration, that's what I do. Every state has outmigration, even low-tax ones. Where do those people go when they leave? Every state has inmigration, even high-tax ones. From whence did they move? Tax rates can explain some of the relocation. In some cases, I'm sure it makes a difference. But the residual (the error of the model) is huge. The migration of thousands (sometimes tens-of-thousands) is left to the imagination. Geographers, by training, are sensitive to the information left out of any picture (i.e. map). When politicians tell migration tales, they omit (sometimes strategically) the bulk of what is happening. What sort of data is buried beneath the "map" the speaker made? Talent gurus such as Richard Florida are guilty of the same kind of omissions. What they see is real enough. But the view is too narrow for purposes of policy discussion. Instead, you appeal to common sense. Brain drain is a problem. Locals are intolerant of newcomers. Taxes are too high. And we go round and round hunting snipe. I've blogged about natural experiments. If you are a policy analyst, journalist, politician, or concerned citizen; give it a read. Devise your own the next time someone gets on a soapbox about outmigration. Portland does a great job encouraging growth along transit lines in developed areas, but it also has a dirty secret: The greenfield area around Powell Butte was a significant contributor to the city’s growth. As Portland’s annexation map makes clear, it has annexed land as recently as the early 90s, and plans to eventually annex the entirety of its urban growth boundary. That means that Portland has as much in common with Forest Lake as it does with Minneapolis. The population growth in the Powell Butte area accounted for a greater share of the city’s growth than the downtown area – although downtown had a higher growth rate and is a smaller area. Still, it’s not really fair to ask a city that has been built out for decades to grow as fast as a city that still has a greenfield advantage. Milwaukee, St Louis and Cleveland are of similar size, age and metropolitan structure, and at first glance Minneapolis and St Paul look good in comparison. St Louis and Cleveland each lost tens of thousands of residents in the last decade, and Milwaukee lost about two thousand – eerily similar to the Twin Cities’ combined losses. But the three rust belt cities also had population booms in their downtowns – all three had growth rates that surpassed Minneapolis and St Paul, and St Louis beat Minneapolis in absolute increase as well. The problem, from places ranging from Chicago to Cleveland, is that the gains in the “core of the core” have been more than offset by losses elsewhere, especially the flight of blacks and other minorities – many of them immigrants – to the increasingly diverse suburbs. Aaron is teeing up to make a different point, but it serves my theme as well. The aggregate numbers gloss over success stories. And among cities with similar challenges and geography, there is enough variance to have a constructive policy discussion. That is a lot more worthwhile than beating yourself up about being so far behind the likes of Portland. The Rust Belt is too fixated on migration to the Sun Belt and not being cool enough. Meanwhile, the core of the core is growing. What can your city do to help that along? There is no need to panic and stop everything, trying to become the next Portland. Minneapolis-St. Paul is figuring out that being the next Cleveland might be a good goal. Watch as International Society of Arboriculture Certified Professionals take to the treetops to prune high up branches and keep mature trees healthy in this exciting family-friendly competition in Allegheny Commons. What got my attention is the location of the competition, Allegheny Cemetery. The cemetery is one of those odd urban spaces that I find so captivating. There's a Rust Belt Chic angle in there somewhere. If you live in the city, I recommend going (both to the cemetery and the competition). The Pittsburgh metropolitan area added 18,200 jobs, ranking it 14th among the 100 metros. It grew from 1,102,700 jobs in March 2010 to 1,120,900 jobs in March 2011. In percentage terms, Pittsburgh ranks 19th. For those of you waiting for the other shoe to drop, there is always next month. The few of you more open to positive indicators, check this out. I think that Pittsburgh is doing well enough to laugh along with the audience enjoying the satire. How to cut Bright Futures is one of many issues House and Senate negotiators are expected to wrangle over in the coming days as they begin trying to resolve budgetary differences. Both chambers have proposed spending cuts in nearly every part of the budget to avoid a potential $3.75 billion revenue shortfall. The Bright Futures scholarship program, funded by Lottery proceeds, was launched in 1997 to stem a "brain drain" of top Florida students to out-of-state colleges. Students could qualify for grants paying 100 percent or 75 percent of tuition and fees at in-state public and private schools depending largely on how well they scored on entrance exams. The program is in peril because supporters made the wrong promise. Increasing the number of adults with college degrees will exacerbate outmigration. (e.g. Pittsburgh 1982) Smart people have itchy feet. Florida tax dollars are fueling brain drain. Ergo, cutting Bright Futures would be a good idea. Besides, why would retirees care about funding higher education? Many states are faced with a similar conundrum. The price tag of a policy was tied to talent retention, an emotional issue for voters. Now would be a good time to engage in an honest cost-benefit analysis. What did Bright Futures accomplish? Ideally, the money allowed people who normally couldn't afford college to go and get a degree. Instead, Florida targeted high school graduates who were going to find a way to pay. Perhaps they wouldn't stay in Florida. But they would attend some institution. I doubt Bright Futures made much of difference in developing people. Instead of starving the scholarship, I recommend retooling it. Look at expenditures tied to low income and think about how the program might help alleviate some of those costs. Consider talent shortages. Tie the subsidy to degree tracks that produce badly needed employees. Regardless, the gutting of funding for higher education is dangerously myopic. Florida is addressing a dire situation by making it worse. Okay, that's one data point, an anecdote. It is also the tip of the iceberg. The stories of revitalization resonate and drive relocation decisions. Yet, Rust Belt cities have decided to do nothing to fuel the trend. Why? We focus way too much on retention. That makes return migrants feel like second class citizens or taken for granted. All the chips are on keeping talent from leaving. One win for urban economic development is ignored. Success, as is often the case, is right under your cynical nose. "We moved here mostly because we hated the weather up there. It rains all the time," said Christina, 21, who will begin studying equine sciences and zoology as a freshman at Colorado State University in August. "Colorado looked beautiful. I applied to CSU and got in." Trading bad weather for good is common enough. Economist Edward Glaeser hones in on temperature as an important predictor of talent migration. But what if we control for climate? ... Then, in mid-2008, she rented a U-Haul and drove to Colorado, where she has friends. The mountain beauty, clean air and relative lack of people were deciding factors. Again, Colorado's amenities are front and center. They are a big draw. How else do you explain leaving job boom Texas for employment starved Colorado? Familiarity with a place trumps a comparison of unemployment rates. It's an irrational choice. Unfamiliarity with a place is like a death sentence, even for regions doing well. That's the Rust Belt curse. Sun Belt natives aren't going to move to Pittsburgh regardless of the job creation numbers. "These places" are the usual suspects of dying cities. There are a few surprises, such as Indianapolis. Blame the folks at City-Data.com. I figure when someone such as Sperling notices a trend, it has gone mainstream. (As if the Chrysler Super Bowl ad "Imported from Detroit" wasn't enough proof.) Rust Belt Chic is the real deal and Pittsburgh, right now, is the biggest winner. Urban grit sells. This post details net job growth in the 100 most populous metro areas from a) 2001 to 2010 and from b) 2009 to 2010. This allowed us to isolate how cities fared in a key post-recession year and for a much longer period. Hot — These select cities performed well from 2001 to 2010 overall, and they saw net job growth from 2009 to 2010. Heating Up — This is an even more select group that struggled as a whole through the decade but are now on the uptick and adding jobs. Cooling Down — This group saw job growth in the early part of the decade but lost jobs in the last year (2009 to 2010). Cold — These cities, many of which sit in the Rust Belt, have shown net job loss in the decade — and from 2009 to 2010. I'll tease you to click on the link to view the lists. Albeit late to the party, in the midst of Rust Belt cold is Pittsburgh hot. In terms of job growth percentage among hot cities from '09 to '10, Pittsburgh trailed only Boston and Chattanooga. By my count, there are only 18 "hot" cities. 4 are "heating up". The other 78 are either "cooling down" or "cold". That puts Pittsburgh in some elite company, in a good way, and makes the metro a major destination for job seekers. Given that Pittsburgh is relatively close to a bunch of cold cities (the power of proximity), it stands to reason that economics migrants who are able will choose Southwestern Pennsylvania as a destination. Just so happens that today I'm blogging this post from a car parked in the Strip District. I spent the latter half of the morning exploring some of Pittsburgh's more obscure neighborhoods (e.g. Troy Hill). I think the funky topography, along with the endless nooks and crannies, will appeal to outsiders. Once the word gets out, the rush will be on. I argue that the "long-term equilibrium" is already shifting. Many cities that suffered most through the Great Recession of the early 1980s, such as Pittsburgh, are poised to rocket past Houston. People are beginning to notice the unique opportunities available in the Rust Belt. Houston isn’t usually thought of as a place that creates new innovations, panelists said, although there have been plenty of ground-breaking developments here, including the birth of the nanotech industry. Rather, Houston has excelled at taking innovations and economically transforming them, adapting niche products and new technologies to mass-market business applications, said Praveen Kumar, a finance professor at the University of Houston and director of the Global Energy Management Institute. “Here is where we can differentiate ourselves, as the place that has developed the specialized workforce to take those ideas to the next level,” Kumar said. Given their histories, Rice University and UH likely won’t be able to catch up to major research universities like Stanford or others by way of the federal research grant model, Kumar said. I like the policy suggestion. But Pittsburgh is in a much better position to execute this strategy. And its regional economy is much more diversified that Houston's. A shock to the energy industry won't derail Pittsburgh like it would Houston. As for developing a specialized workforce, Pittsburgh excels at that. Talent production is a major competitive advantage for Southwestern Pennsylvania. I think Pittsburgh can beat Houston at its own game. Families that remain in The City are bucking the trend that has plagued San Francisco for years as the number of children — defined as people up to 17 years old — has dropped from 181,532 in 1960 to 107,524 today, according to the latest U.S. Census Bureau figures. The 2000 census counted 112,802 youths. While Portland, Oregon has a child population slightly higher in proportion to the national average, Portland has struggled to retain families, despite affirmative efforts to do so. From 1990 to 2003, the city added more than 90,000 people, growing to an estimated 529,121 residents. According to demographers at Portland State University, the number of school-age children grew by only three between the census counts in 1990 and 2000. Relatively better off, Portland isn't on par with San Francisco as an immigrant destination. Immigration glosses over how people are voting with their feet and fleeing the Bay Area. At a minimum, the urban core is in a state of steep natural decline. Detroit best keep that in mind the next time someone laments that Hockey Town isn't more like San Francisco. And what the hell is Governor John Kasich babbling about? “The whole thing is a kind of [a] chicken and egg problem ... the investment capital doesn’t come,” says Galvin. Why doesn’t enough capital come? Because there aren’t enough startups to attract investors. There aren’t enough startups, because there isn’t enough capital. Solving that dilemma requires a certain degree of critical mass in the region. In the final part of our series we’ll look at strategies the university and the community can employ to ramp up the pace of growth in Ithaca. I've read and heard the same lament in Pittsburgh and other Rust Belt cities. I think the issue is simply encouraging people to take risks. More capital is one way to accomplish this. Another way is to engineer or manage the right kind of migration. Attract more immigrants and you'll see more startups. Regions overlook this opportunity because the community is focused on the wrong metric, population. If someone isn't willing to create a job in order to stay, then the region would be better off letting him or her go. Those who could leave but choose to stick around are entrepreneurial. Invest in these people, nurture them. Think of the initiative as a talent retention incubator. “Like the guy who’s almost got a PhD who’s working as a bookstore clerk,” notes Joe Wetmore, who owns what may just be the quintessential college town business, a used bookstore called Autumn Leaves, on Ithaca’s downtown shopping drag. Wetmore sees people stop by his store all the time, with a lot of degrees, but no work. I've seen the same thing going on in Boulder. For somewhat different reasons, I'd include Pittsburgh. The common thread is a low rate of outmigration for the college educated. InnovationTrail headlines the above article, "Ithaca is a bright spot in upstate jobs picture, but has its dark side too". The dark side is what happens when the brain drain gets plugged. Great, graduates are sticking around town. Now what do you do with them? Regions don't get that far when crafting policy, retention for the sake of retention. Think of this photo as an aesthetic test. Do you see beauty? Pittsburgh is also striking in more conventional ways (e.g. the dramatic physical geography). 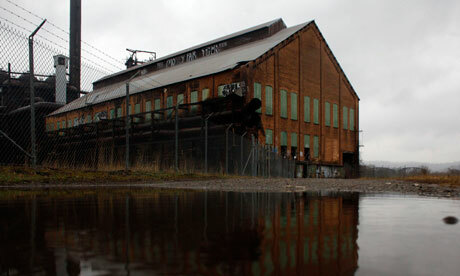 But I expect that most people don't appreciate the postindustrial pathos. I have mixed emotions about the image. I'm also deeply attached to this landscape. I react to the urban forms of Portland and Seattle like I would a suburb: Sterile and superficial. Photographer Garrett MacLean relocated here from San Francisco in 2007 and cofounded the Yes Farm with two fellow transplants -- a cooperative helping stabilize a tattered east side neighborhood. "When I moved here, nine out of 10 people who live here looked at me as if I was crazy," said MacLean, 33. "That's changed completely. When people move here now there's no longer any stigma." Photographer PD Rearick, 32, a recent graduate of the Cranbrook Academy of Art, started a local business serving the photo needs of artists. "I can be an entrepreneur and take a risk without having to bear the consequences of a bigger city," said Rearick. The Creative Class isn't moving to Detroit or Pittsburgh because of a turnaround in tolerance, talent, and technology. People are migrating to shrinking cities in search of Rust Belt Chic, the antithesis of the emerald boomtowns. They are looking for authenticity and an urban frontier. They identify with Anthony Bourdain, not Richard Florida. We need to update our policy playbooks and rethink what we know about talent migration. The Pittsburgh area is No. 23 in the standings of 100 major metropolitan areas, as rated by The Business Journals, the online arm of Business First’s parent company, American City Business Journals Inc.
Other big movers in the rankings I noticed are San Jose, Syracuse, and Buffalo. Data for 2009, 2010, and 2011 are listed. Overall, I'd say the results are volatile. What goes up one year can come down just as dramatically the next. Pittsburgh in Pennsylvania climbed from ninth position in the 2009/10 ranking to be crowned as the number one Large American City of the Future 2011/12. The Canadian city of Halifax ranked second, followed closely by Charlotte, North Carolina. Seattle ranked as the top large city in both the economic potential and infrastructure categories. fDi ’s independent judging panel was impressed by the FDI strategy information submitted by Victoria, Canada, which resulted in the city claiming the top position in this category, followed by Charlotte and Pittsburgh. As you can imagine, the Pittsburgh Regional Alliance is all over this self-promotion opportunity. I recommend watching the short video interviews with the likes of Greg Babe, CEO of Bayer. The narrative is well-crafted. Pittsburgh is on top because of talent and strategic location. The region sits between major markets in the Midwest and along the East Coast. From the standpoint of that particular economic geography, what other city can compete with Pittsburgh? Then consider the regional workforce and the strong institutions of talent production. Critics tend to overlook these advantages and focus on the population data. The "shrinking city" tag is the only reason the fDi Magazine rankings are such a surprise. Which brings me to my broader point: there are plenty of similar success stories. Look no further than Pittsburgh, once the poster child for rust-belt decay and population flight. The city evolved into an educational, medical and technology hub and is now attracting energy companies seeking to extract natural gas from the Marcellus Shale that underlies a vast four-state region. Energy is also the story in Oklahoma City, largely stagnant for two decades following the energy bust of the mid-1980s. The "broader point" is reinvention for a few metros. Energy is the centerpiece of the OKC economy. For Pittsburgh, the picture is more complicated. Just how much is unconventional gas responsible for the recent run of great job growth news? On the other hand, an energy-centric economy isn't all it is cracked up to be. The wealth generated doesn't necessarily translate into more employment opportunities for locals. Furthermore, industry has a poor track record of painting too rosy a picture of growth in order to gain access to the goods. "Our study demonstrated that new coal-powered plants simply don't deliver on their promise of new jobs for host communities, in fact, they don't even come close," said David Eichenthal, President and CEO of The Ochs Center. "The fact that only one of the large plants built in the past five years appears to have provided the number of jobs it promised shows that communities being asked to take on the burden of hosting new coal plants need to take promises of new jobs with more than a grain of salt." The report, which reviewed figures publicly promised by companies constructing coal plants and compared them to actual construction job creation in the county, is the first effort to measure one of the most important figures that communities rely on when deciding whether to approve new plants. That someone would inflate job numbers to win the deal shouldn't surprise anyone. I'd equate the above alarm about the promises made in the debate about a shale gas severance tax in Pennsylvania. I keep reading how the policy will kill the goose laying the golden egg. How the murder will result from the tax is left to the imagination. Or, worse, the Marcellus Shale Coalition offers up some crazy scenario that doesn't make a lick of sense. It is nothing more than a scare tactic. That's the problem with hydrofracking. The industry simply isn't credible. It denies the obvious, such as the steady stream of workers flying in from Texas, Oklahoma, and Colorado. As if we wouldn't notice all the "no vacancy" signs in Williamsport. Yet there appears to be a dividend. Is it connected to the lack of tax? I doubt it. Also, if you happen to know a return migrant (or trailing spouse), please pass along the above link. In the Cincinnati MSA total employment in February compared to February 2010 was up 1 percent, an increase of 10,200 jobs, according to data released this week by the U.S. Bureau of Labor Statistics. Compared to selected regional competitors Cincinnati’s employment growth ranked 7 out of 12 (see Table 1). Raleigh and Pittsburgh ranked 1 and 2 with growth rates of 2.5 and 2.1 percent respectively. Each of the 12 metro areas saw job growth between February 2010 and February 2011. Besides Raleigh, the peer group includes Columbus, Charlotte, Austin, and Denver. There are more than a few strong metro performers on that list. Pittsburgh is the cream of the crop in terms of recovery. Pittsburgh is undoubtedly the biggest surprise at the top of the standings, but its high position is merited. The Pittsburgh area has added 23,600 private-sector jobs in the past year. And its unemployment rate of 7.9 percent is a full point below the corresponding national rate for February, 8.9 percent. You can find some of the February employment numbers for metro Pittsburgh here. The data stretch back to 2005. The peak was in 2008 with 1,128,000 nonfarm jobs. 2011 chimes in with 1,112,100, a 2.2% gain over 2010 (good enough for 9th best in the entire country). By my reckoning, Pittsburgh will need a bit over a 1.4% year-over-year rise to match the February zenith posted in 2008. To summarize, the job growth rate could decline 0.8% and Pittsburgh will still be experiencing full recovery from the Great Recession. Given the recent job growth rate trends, that would appear to be a slam dunk. However, I also expect the unemployment rate to be higher than it was in February 2008 (4.6%). Why? Total labor force will have grown significantly. Blame net inmigration. A decade ago, urban economist Paul Gottlieb coined a term for this disconnect between population and economic growth. He called it "growth without growth," a construct former Ventura Mayor Bill Fulton has picked up on in recent writings. When Gottlieb compared population growth to growth in real per-capita income in the 100 largest U.S. metropolitan areas, he found a pattern similar to what we discovered for states. Like states, U.S. metros divided into four categories. Some -- like Atlanta, Austin, and Dallas -- were above the national average in both categories. Others, including many older Rustbelt metros, were below average in both. But it's the last two categories that were more interesting. Much as we found with states, half of the 100 largest metros divided into "population magnets" -- places where population grew but not income, and "wealth builders," where incomes rose much faster than population. When Marja M. Winters was studying urban planning in graduate school, she learned the art and science of helping cities grow. Even in Detroit, where the population shrank by 25% since 2000, downtown added 2,000 young and educated residents during that time, up 59% , according to analysis of Census data by Impresa Inc., an economic consulting firm. "Fewer women in their child-bearing years" defines just about any shrinking Rust Belt city. But that doesn't mean a neighborhood is doomed. Women with higher levels of education tend to have less children. They are also excellent wealth builders and could help stabilize a troubled city such as Detroit. As you will find in Pittsburgh, the educational attainment rate of the workforce is going up along with the numbers of the total workforce. All this is happening while the population has been going down. As I wrote yesterday, Pittsburgh is projected to be an economic boomtown over the next 15-years. Do the population numbers even matter? A closer look below reveals that the Chicago metropolitan area has attracted both the highly educated and the less educated. The share of Chicago’s foreign born who hold a college degree is below the U.S. average. In contrast, in the remaining metropolitan areas of the Midwest, the foreign born population includes a greater share holding at least a bachelor’s degree in 2007. According to sample data from the U.S. Census Bureau, an incredible 50 percent of Pittsburgh’s working age population who were foreign born hold at least bachelor’s degree. Detroit, Cincinnati, St. Louis, and Columbus are not far behind. While Pittsburgh would benefit from more immigrants, the current small flow has packed a powerful economic punch. Rust Belt cities don't need to boost inmigration so much as they need to strategically channel these existing flows to specified targets. Detroit's prescribed triage approach would dovetail well with this migration strategy, which is much more in line with the demographic realities of today. Both 2005's "Batman Begins" and 2008's "The Dark Knight" shot on location in downtown Chicago (standing in for Gotham), and Moskal estimates that the films spent in excess of $50 million combined when they were here — on crews, vendors and hotels, among other expenses. The announcement of Pittsburgh as the location of the third installment might be bigger than Google Fiber (which went to KC). Moskal goes on to say that Nolan put Chicago on the map for other film projects. The $50 million was the icing on the cake. The city is still enjoying dividends without The Dark Night Rises. As for Pittsburgh, landing the project is another home run for a region with an ever increasing economic portfolio. Do check out the Pittsburgh Art + Technology initiative. There is a lot more going on than just filming. $25 million being spent in the city doesn't hurt, either. New York and Pittsburgh had the highest effective rent increases from a year earlier, at 2.8 percent, followed by San Francisco at 2.7 percent, Reis said. Pittsburgh “has held up really well,” said Jones of CBRE. The city’s concentration of employment in the energy industry has helped bolster rents, he said. Pittsburgh is on a tear right now. I'm beginning to think that I haven't been bullish enough on the region's future. I didn't expect this shrinking Rust Belt city to escape the gravity of its past (save the public pension liabilities) so quickly. I was most surprised by the lack of economic growth in Portland. You can see that Pittsburgh stands up well to some stiff competition. For the United States, it is a hot spot. To be sure, the population increase is modest. But I don't put much stock in such metrics. Most of that growth will come from net inmigration, not a robust birth rate or significant immigration. Pittsburgh will be attracting a lot of talent and will serve as the anchor for the Eastern end of the Chi-Pitts megalopolis. Noteworthy: Rebounding manufacturing job growth is tied to above-average rent growth in Detroit, Cleveland, Chicago, and Pittsburgh. I don't fully understand the suggested connection between manufacturing job growth and above-average rent growth. Anybody reading this care to educate me? I'm skeptical that more manufacturing jobs are pushing up rent in Pittsburgh. Real estate refugees fleeing expensive California isn't news. The surprising part of that migration pattern is the continual influx of talent into ridiculously overpriced San Francisco. Richard Florida does a good job of explaining why people continue to cram into urban cores. Less understood is the spillover to destinations such as Portland, Oregon. For example, I'm aware of more than a few tech workers who fled the Bay Area or Silicon Valley for the cheaper confines of Fort Collins, Colorado. Some kept their old jobs, taking those big salaries with them. It is a form of geographic arbitrage for the top tier of the upper middle class. It is also proof of Flat World migration. Confounding the Creative Class relocation model, the world gets less spiky and new centers of innovation emerge thanks, in part, to lower costs. ... The greatest changes are in the city's First Ward and North Side, where the number of whites fell nearly 10 percent in the past 10 years, census data shows. "We've seen the same migration patterns other cities across the nation have shown," Abdelazim said. That's because people migrate to an area where they can afford to live, said Binghamton Mayor Matthew T. Ryan. Rents in Binghamton are far cheaper than in New York City. Economically, minorities are also less likely to have the opportunities that other people have in bigger cities, the mayor said. "When you have cities not providing affordable housing that is needed, there will be migration," Ryan said. "Upstate cities have this." What seems to be happening is that whites are following Florida's Creative Class model, leaving Binghamton for the likes of New York City. This drives up the cost of living in NYC as more neighborhoods there are gentrified. This inflow displaces primarily minority populations who then seek the opportunities available in struggling Binghamton. The above trend tends to get buried under the strong numbers of immigration and robust replacement rates that grace the largest cities, the so-called population winners. In terms of domestic migration, many cool cities are shrinking just like Pittsburgh or Cleveland. There are only so many people who can afford to live there. But is an emphasis on vocational training the right direction for Texas? Scott McCown, executive director of the progressive, nonpartisan Center for Public Policy Priorities in Austin, says that “community colleges are a bright spot” on an otherwise bleak educational landscape in Texas, where keeping business taxes low takes priority over an educational pathway toward advanced science, math and engineering. Texas is in a squeeze. A third of the workforce is caught in a skills gap that is experiencing a rapid decline in jobs available. On the other side is the paucity of highly skilled workers (i.e. knowledge workers) produced instate. Relying on migration is a risky prospect. Tech companies would be better off locating near where the talent is produced (e.g. Pittsburgh). Whichever workforce development policy course Texas chooses, the benefits are far off in the future. Migration is the quick fix. Education is the long, hard slog. Many companies can't afford to wait. Time to move to the Rust Belt. Urban cores attracted increased numbers of young adults even in metropolitan areas that were losing population and hemorrhaging talented young workers. Cleveland and Detroit, both of which experienced an exodus of 25 to 34 year-olds over the past decade, saw an increase in the number of young adults with a college degree in their close-in neighborhoods. There is a chart titled, "Percentage Growth in 25 to 34 Year Old Population with a Four-Year Degree, 2000 to 2005-09, by Metropolitan Area, Close in Neighborhoods and Balance of MSA" with all the data. What is interesting about Detroit and Cleveland is how well the urban core fared compared to the rest of the MSA. Both metros lost young talent. Across the board, Rust Belt cities do very well in attracting this prized demographic cohort. Rust Belt Chic is a hit with the Millennials. I think this is harbinger of good things to come. Public services, particularly transportation, don't extend well into the suburbs. This creates a captive labor market (anyone who has studied gender and employment knows this tale all too well) that is extremely vulnerable to exogenous shocks. Imagine what high gas prices do to the journey to work for those stuck in female-dominated jobs. Compound that with fiscal crisis and you'll begin to appreciate the problem with the dominant economic geography of the last few decades (suburban growth). The overall decline in geographic mobility is particularly troubling. The unemployed are stuck. They can't move or commute to where the jobs are. If you are going to fund relocation, make sure the residential destination is in the urban core.